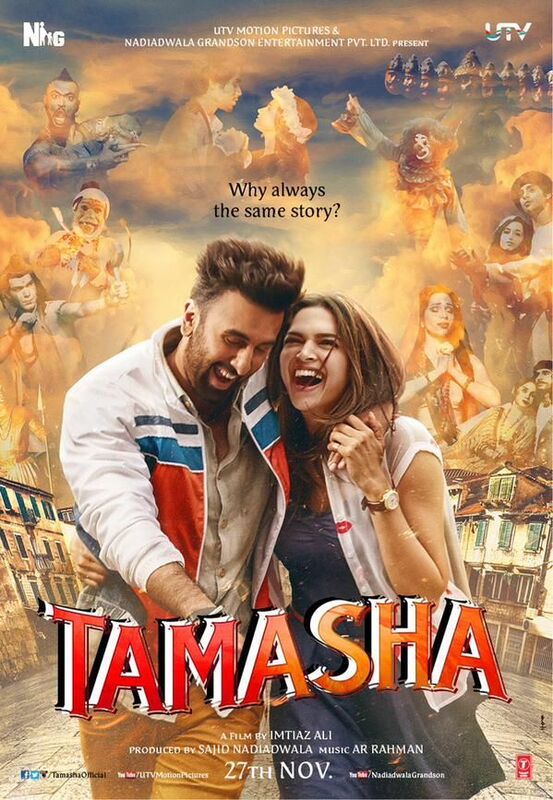 Tamasha is an abstract, which won't go down easy in your digestive tract. Film starts with a wacky storytelling concept which keeps you bewildered and might be repulsive for some. 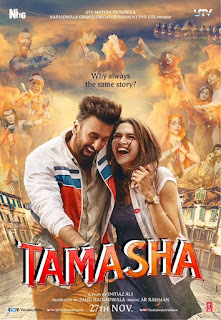 I can draw a parallel between Tamasha and a 3 course meal. 1st course is a dubsmash, where video is of 2015 but all the dialogues are from 1970s films (Teja from Zanjeer, Mona Darling). If you can't relate with that era, you won't be able to decrypt the cryptic filmi language. Ranbir extends this character to play Dev Anand and fails miserably in mimicking his mannerism. 1st course lasts for 45 min and is largely unimpressive, far fetched and way too filmy. 2nd course starts with a peppy song "Heer Toh Badi Sad Hai" and the film transitions from a Matargashti to a mushy mushy romance. Plot starts coming on track and looks believable, however this happiness is short lived and what follows is an hour long emotional melodrama. Character sketch of Ranbir is half baked and shifts gears from being a non-conformist of herd mentality ==> battling with internal complex ==> Schizophrenic ==> Wondering what director has in mind ?? Lack of clarity in Director's vision rubs off on lead characters and makes audience scratching their head. You'll also see inspiration derived from Hollywood classic Groundhog Day (1993) in showing routine scenes. 3rd and final course is a short 30 min power packed punch, which explains the mayhem shelved out at audience for last 1 hour 45 min. This is where the message becomes crystal clear and you admire the abstract beginning and director's point of view. However, it is too late and difficult for audience to appreciate the film. Having an awesome dessert doesn't absolve your sins of serving tasteless bland food. Director Imtiaz Ali is a champion of romance and his effort of delivering an abstract art film fell flat on his face. I can clearly see him bruised and distributors bleeding at the box office. Ranbir Kapoor handled his highly ambiguous characterization very well. Alas, his role is highly confusing for which I won't blame the actor. Deepika Padukone is consistently mediocre without any effort on improvement. Piyush Mishra as storyteller is marvelous and talks in poetic language (as always), which is very classy. I am sure he must have written some of those dialogues as well. Cinematography by Ravi Varman is impressive but not a differentiator. These days, every film has great photography, locales and sets. Music by AR Rehman is above average with special applause for "Heer Tu Badi Sad Hai". Music in other songs isn't impressive but none of the songs are forced and very situational. I loved the spread of singers ranging from Mohit Chauhan, Mika, Lucky Ali, Arijit Singh, Sukhinder Singh to AR Rehman himself. Wow! Verdict: Definitely a hatke film as poster says, Why always the same story? It could have been a wonderful film if it was executed well. Don't go to theater expecting a lighthearted fun filled romantic film. This film might leave you a little heavy. Message delivered in the end is indeed inspiring.